17-foot long art installation chronicles slain officer’s life and contributions. Southcoast Health renamed its inpatient pediatric unit at St. Luke’s Hospital the K-9 Sgt. 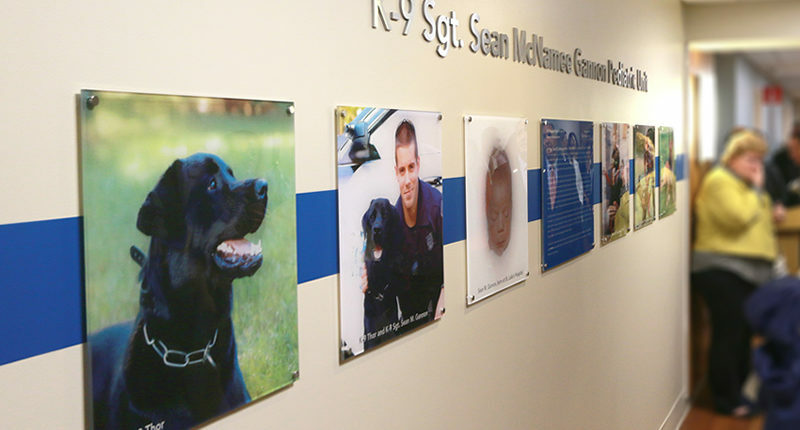 Sean McNamee Gannon Pediatric Unit to honor the life and contributions of the officer who lost his life on April 12. The dedication took place in a private ceremony on September 18, 2018. A member of the K-9 unit of the Yarmouth Police Department, Sgt. Sean M. Gannon, was shot and killed in the line of duty. His dog, Nero, was also shot but survived his injuries. The idea to dedicate the pediatric was presented by Hovan to the Southcoast Health Board of Trustees, and was unanimously supported. “Many of us on the Board have worked closely with Pat over the years, ” said Jason Rua, Chair of the Southcoast Health Board of Trustees. “We have come to know Pat and Denise quite well and are thankful for the tremendous work and many years of dedicated service.